Recently, I took a leaf out of Stuart Ashen's book. For those of you who don't know Mr Ashen, I highly recommend visiting his website. Not yet - read my blog first. Visit him later. When you're bored of all this board game stuff. Actually, forget it. Just stay here. He gets enough visitors as it is. Mr Ashen is a bit of a legend, and regularly posts reviews of complete crap, some of which he purchases in Poundland (the equivalent of a Dollar Store). So, recently I popped into a Poundland to see if they had any fun toys. They didn't. 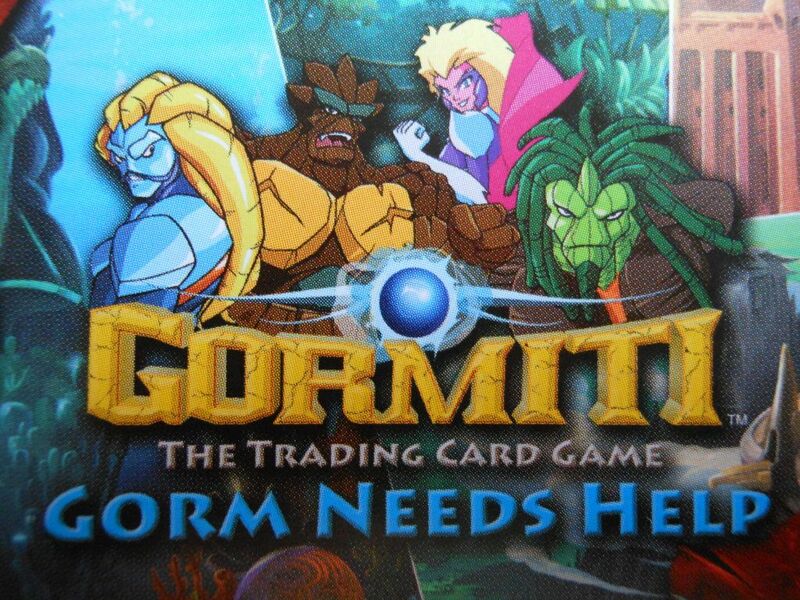 But what I did find were starter sets for Gormiti: The Trading Card Game. I don't really like trading card games. I like to buy a game and know I won't need to keep buying stuff to make it good; but considering I could pick up two starters for £2, and considering I didn't expect the game to be good enough to bother expanding it, I paid my money. 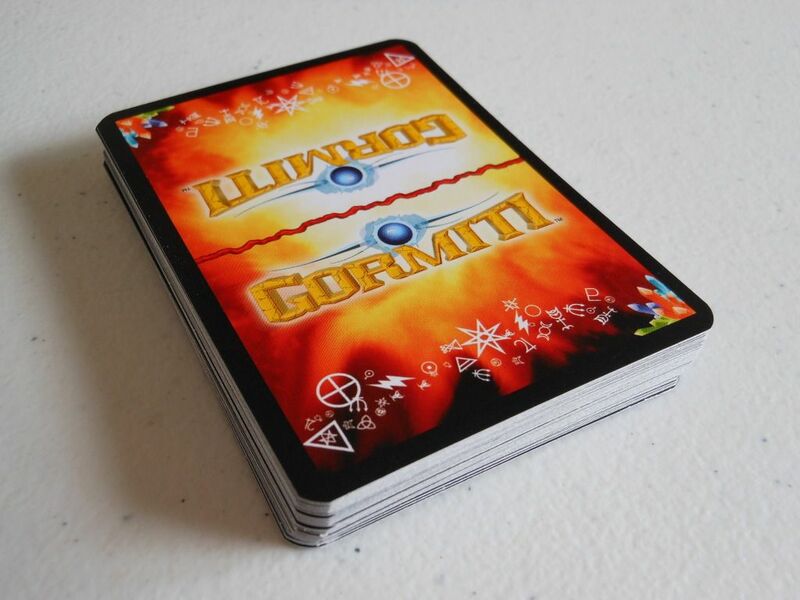 So here it is, in a special tribute post to Mr Stuart Ashen: A review of Gormiti: The Trading Card Game. An excellent game. He lied. This is one of those games based on a cartoon that has also spawned a whole bunch of toys and other paraphernalia. That means the theme will automatically appeal to those people who know the show, and will totally alienate everyone else with lots of stupid words and named characters. As far as storyline goes, there seems to be four children who can turn into monsters, and they fight other monsters. I'm not really sure how or why they do this, and I don't really care. It's all a bit silly, and it doesn't really matter anyway. I purchased both of the starter sets, each containing 40 cards and a rule book. One of the starter sets is themed "earth/air" and one is themed "forest/ocean." I guess if I knew more about the show, I might know why fire has been replaced with forest as the fourth element. 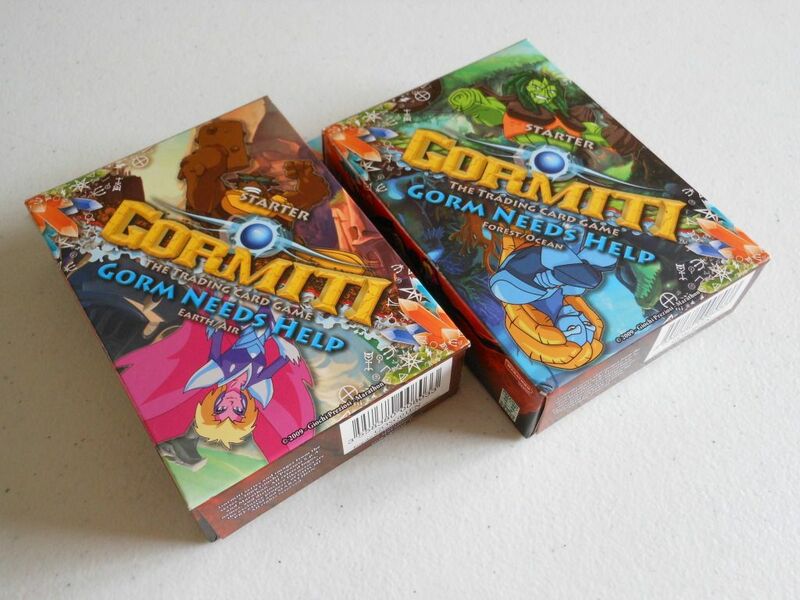 Both boxes also claim that "Gorm needs help." 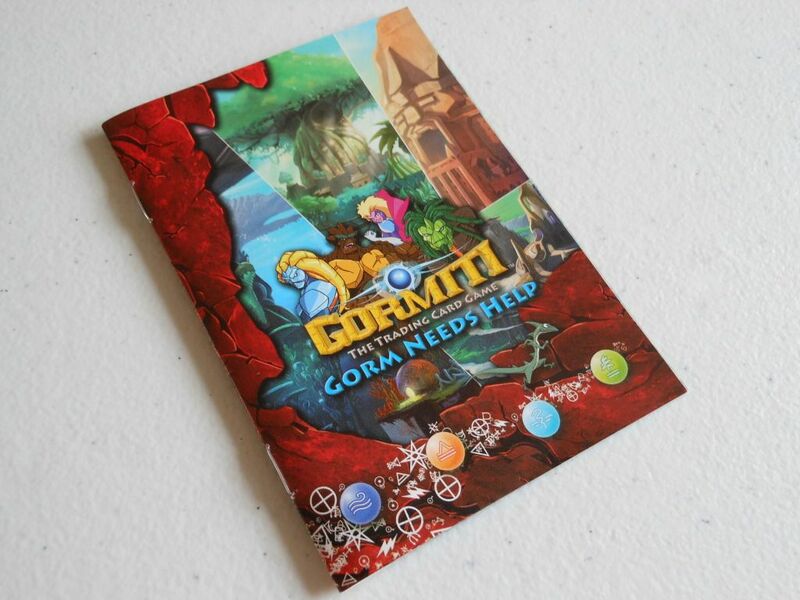 I don't know who Gorm is, but I suspect he may be the designer. 40 cards doesn't seem a lot, but you only draw one card per turn. The cards are actually very decent quality, and they are well printed. The downside is they use artwork from the cartoon. It's bold and bright, but it looks bloody awful all the same. This is definitely not one of those collectable games that encourages you to buy more cards simply so you can marvel at the exceptional artwork. One of the first things you will notice flicking through one of the starter decks is that all of the cards represent characters. There are no items, no events, no spells. Furthermore, if a character has a special ability (only a few of them do), then the details of the special ability are written in full on the card, so you don't need to reference the rule book at all during play. It makes it all very obvious that this is not going to be a particularly deep game. The emphasis is on dropping characters on the table and then letting them fight. To start a game, each player takes a 40-card deck, gives it a shuffle, and then draws a number of cards that are set aside face down. Player one sets aside five, while player two sets aside six. These cards represent "life orbs" or some such nonsense. When they are all gone, you are dead, and you lose the game. Players then draw a hand of five cards and play begins. The total threat represents the amount of power each player has available to summon monsters. Yes, you read that right. 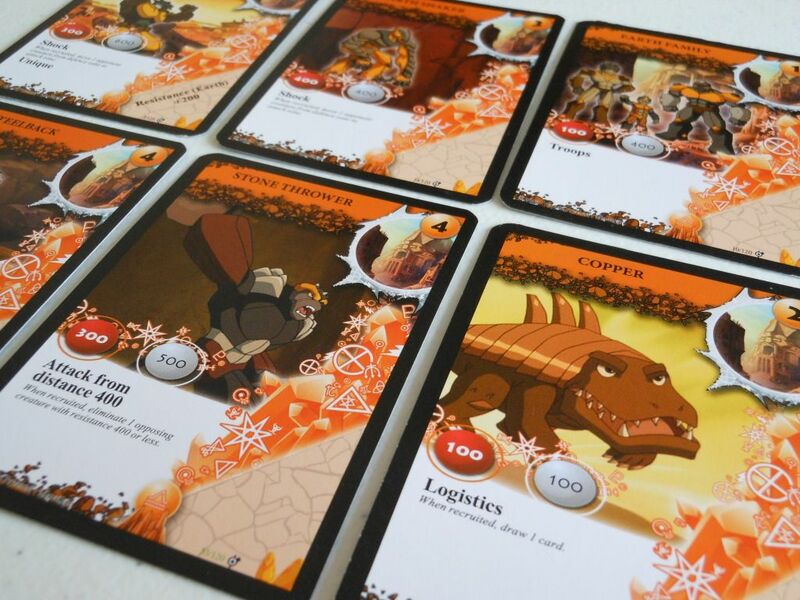 Each player has the exact same amount of power to summon monsters each turn, and that amount is determined by the game round and not by anything either of the players has done. This is an utterly bizarre element of the game. I believe it may have been done to simplify the game for younger players, as it removes one of the more difficult elements of deck construction. That is to say, this rule removes the need to create a deck with a balanced mix of creatures and power-producing cards (such as "land" cards in the game Magic: The Gathering), so when you are putting together a deck, you just have to worry about including all your favourite characters. After the threat level advances, player one draws one card into his hand. He can then summon characters. Each character has a summon cost, and you can summon as many characters as you like as long as their total summon cost does not exceed the threat level. These characters are played to a recruitment zone, which simply means they cannot be used to attack this turn. The problem is, most of the characters have a summoning cost of four or more, and some are as high as seven or eight; so if you get unlucky with your opening hand, you may not be able to play a character for the first three or four turns. Not only is this boring, but if your opponent is lucky enough to summon a character with a value of one in his first turn, then you could be faced with two or three turns of being attacked with no way to defend, resulting in a very short game indeed. There really is nothing more annoying than playing round after round in which your opponent pecks away at your health because you are unable to bring any characters into play. A sample of the glorious artwork on the cards. Yes, this is one of those games where bad luck with your initial hand spells instant defeat; and there's nothing you can do about it. After summoning, you can attack with any characters that are not in your recruitment zone. You can attack with all of your characters, but it is usually a good idea to hold back a few characters to defend with when your opponent attacks. To attack, you specify which characters are involved. Your opponent then selects defenders. One character can defend against each attacker. For each unopposed attacking character, the defender will lose one "life orb." If a character's attack is blocked, you compare the attacker's strength to the defender's resistance. If the strength is higher, the defender is killed and the attack gets through anyway. However, you also compare the defender's strength to the attacker's resistance, and it is possible for the attacker to die. It is therefore possible for both an attacker and defender to die at the same time. Some cards also have a bonus modifier for strength or resistance printed in the bottom right corner. During any combat, players can play any number of cards from their hands as modifiers to try to help win a fight, after which, those cards are discarded. Of course, if you use all your cards to modify a battle, you won't be able to use those cards to summon the characters printed on them, so there is a bit of hand management involved in deciding when to play a card as a modifier and when to hold on to it to play the character instead. This simple choice probably constitutes the only slightly interesting decision a player will be presented with on a turn. After all the combats are resolved, and dead characters removed from play, the defender must remove one "life orb" from his stack for each hit that got through. The way health is handled is probably the most interesting aspect of the game, as each "life orb" card you lose gets put into your hand; so as you take damage you gain more cards to help you fight back. It's a relatively interesting balancing mechanism to prevent a runaway winner, and feels like it has been half-inched from a much better game. Once player one has finished attacking, any characters in his recruitment zone become ready for use, and then player two summons characters and attacks. When player two attacks, player one can only defend with characters that did not attack this turn (either because they were kept back on purpose, or because they were waiting in the recruitment zone). And that's it. Lather, rinse, repeat. No interrupt cards. No special event cards. No way to draw more cards. No way to summon stronger characters until the required number of game rounds have passed. No way to link together card combos in exciting ways. 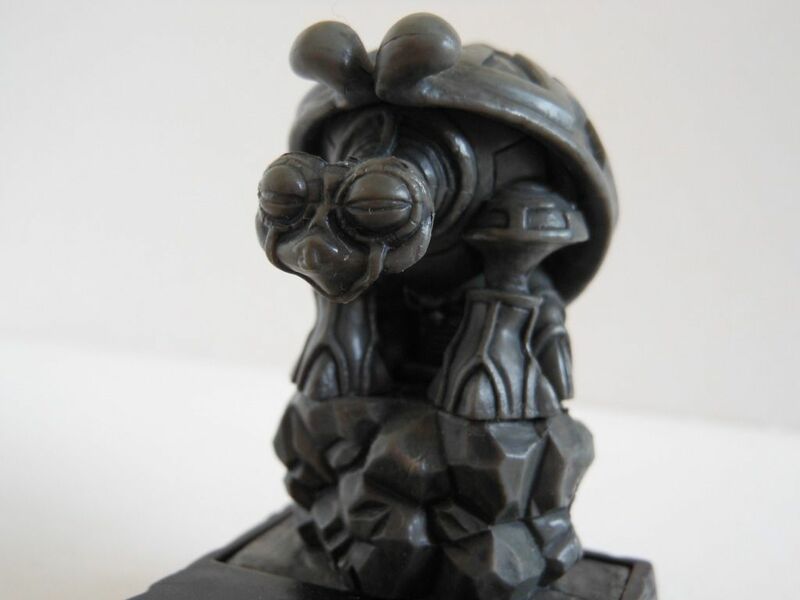 This guy has nothing to do with Gormiti. He is from a much better collectable game that I will be reviewing next time. 10 points to anyone who can name the game. If one player can get lots of characters out early on, the game will be over in just a few turns, especially if the other player is unable to summon any characters to defend with. Conversely, if both players are able to get characters out early on, the game can drag on for an age as neither player is able to land a successful attack. That means, the game will be quick and boring or long and boring. You don't have a choice in the matter, just like you often will not have a choice of which card you can play on a turn. This is just an exercise in drawing and placing cards, with no real thought required. Although I generally enjoy "heavy" games, I don't actually have a problem with games that involve quite a lot of luck, or which have only limited options available on a turn. However, I do insist that a game should be fun. This game isn't fun. It's oh so dull. The designer tried to take a trading card game and streamline it for simplicity and accessibility for a younger market, but in doing so, all the fun got streamlined out. What's left can hardly be classed as a game at all. As I already mentioned, I paid £2 to get the two starter sets. Even at that price, I don't think I got value for money. I will certainly not be keeping this game. I mean, it doesn't even have any pretty pictures to look at. wow a lot of writing. a lot.